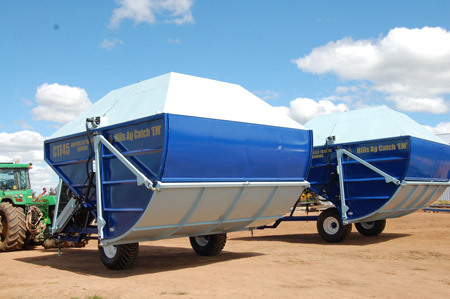 A Catch ‘EM’ Chaff Cart works in both continuous cropping and mixed farming. It can capture weed seeds at harvest and can provide easily accessible fodder for sheep during summer. The Catch ‘EM’ Cart is suitable for any class of harvester with hitch options for all makes and models. All carts are built to customer specifications, with the choice to modify front elevator lengths, drawbar height and the options of single or double hydro motor drives for elevators.